We're highlighting our top picks and customer favorites to create the Hampshire Pewter 2016 Best Gifts for Him Christmas Gift Guide - can't miss gift selections for the favorite guy in your life! Perfect for the office or the man cave. 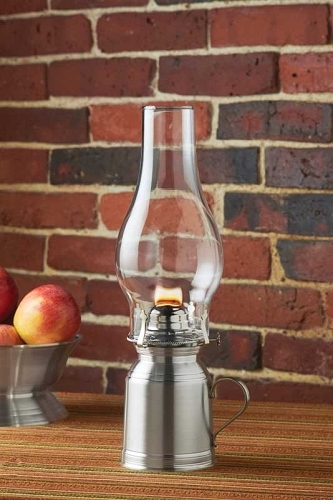 This sturdy traditional New England style lamp is a handsome piece to display on a mantle, desk or table and is the perfect lighting back-up during a storm. The pewter base is made from our strong Queens Metal™ pewter castings that cannot shatter and spread burning oil. The burner just unscrews for easy filling, and burns standard lamp oil. May be personalized with your special message. Engraving is done on the face with the handle to the right. Guys just love our tankards - and what's not to love? 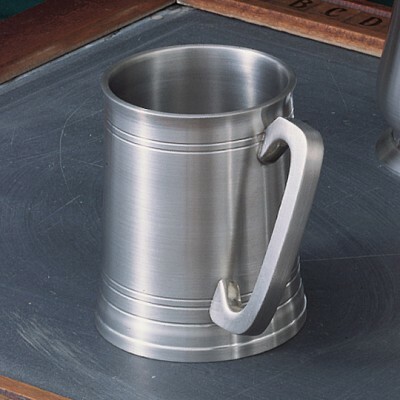 Made to be used, Hampshire Pewter tankards are as practical as they are beautiful. The body of each tankard is hand cast in one piece with a pewter base, designed slightly wider than the top for stability. The bottom is solid pewter soldered into the body (no glass bottoms here). But the real selling feature for the guy on your list is they keep beverages nice and cold! This is a memorable gift that will be cherished long after it is given. 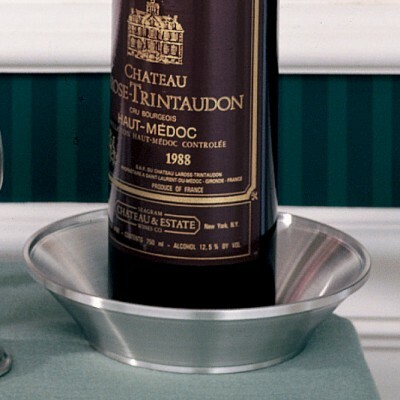 Our Wine Caddy is a fine choice for the wine connoisseur on your list. The sleek profile and satin pewter finish make for a handsome gift. Pair it with his favorite label to convey the "spirit" of the season. Engraving available on inside bottom - under removable cork liner. 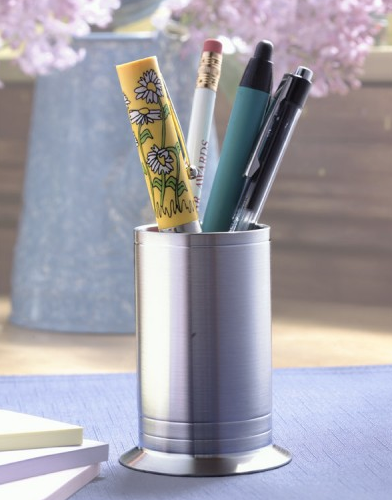 Our pewter Pencil Holder is designed to add a touch of class to his desk. Hand-crafted, using our strong pewter alloy it will stand the test of time and serve as a daily reminder of just how much you care! Looking for the perfect gift for a golfer? 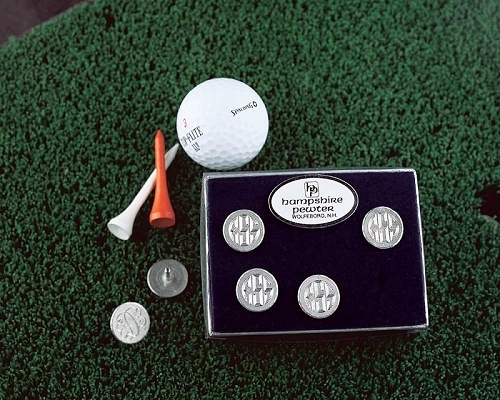 Hampshire Pewter ball markers are it! Packaged in a set of six, they are handcast and finished in our New Hampshire workshop. We'll personalize them for you to add the finishing touch with a choice of engraved monogram or initials. Personalization included for same engraving on the entire set. The perfect accessory for travel bags, computer bags or gym bags. Choose from several different designs and engrave a message or initial to show your guy just how unique he is! 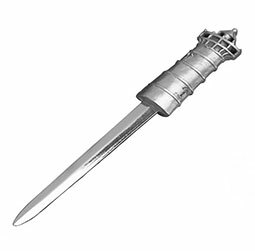 Modeled after the Portsmouth Light in New Hampshire, our lighthouse letter opener is the perfect desk accessory! Great in his office, den, or kitchen for safe (no papercuts) and easy access to mail. With a 5" nickel-plated steel blade that will hold up to years of use, it makes for a lasting gift! Make Hampshire Pewter your Christmas gift destination. 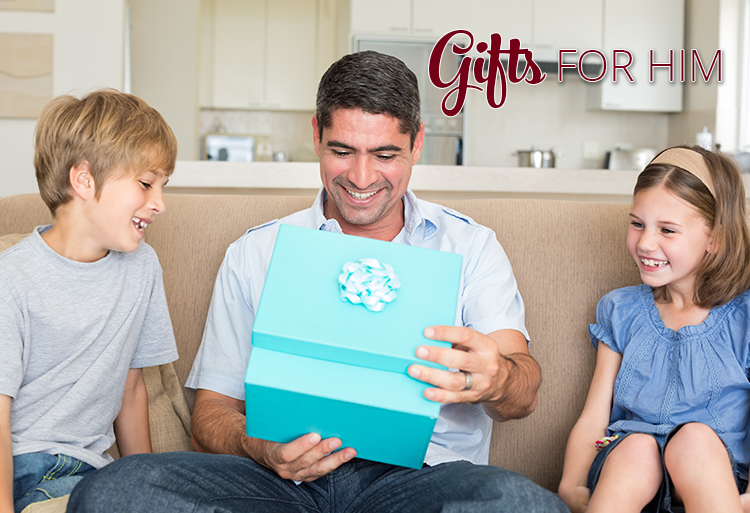 View our complete catalog for more gift ideas and something to suit everyone on your list!